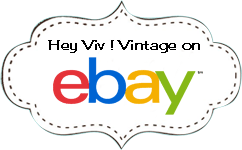 Vintage Inspired 50s Style Sweater Guard or Scarf Clip - Black Bead Cardigan Clip by Hey Viv ! Look for the tiny silver heart charm - it means this is an exclusive Hey Viv ! design. Inspired by 1950s sweater guards this design is made exclusively for Hey Viv ! and uses the highest quality findings and pearls. Comes in an organza gift bag.